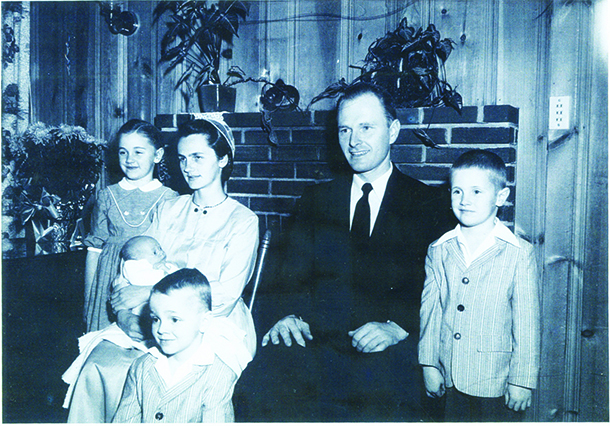 In a 1959 photo, accountant John Hostetter (center) posed with his wife Mildred and oldest four children: (clockwise from John) Vaughn, Alden, David and Beverly. No more than 25 feet north of my home (I live almost adjacent to EMU) resides one of the best neighbors a person could have, Mildred Heacock Hostetter. She graduated from what was then Eastern Mennonite College (EMC) in 1950. Mildred married John Jacob Hostetter Jr., whose desire to study business-accounting prompted him to transfer from EMC to Madison College (now James Madison University) for his last two years of school, finishing with a BS in business in 1956. Mildred tells me that EMC’s idea of teaching business in the late 1940s and early 1950s was instruction in typing and bookkeeping. John taught courses in accounting, economics and business administration during 1956-57 at EMC, then headed to Indiana University where he earned an MBA with a focus on accounting in 1962. The following year he became a CPA. He taught accounting part time at Goshen College, while maintaining an accounting practice serving Goshen and vicinity. His professional brochure from that period said, “Since 1962 our business has been helping others achieve.” He stressed the importance of estate planning and the value of deferred charitable giving. Mildred recalls that EMC president Myron Augsburger invited John in the late 1960s to return to his original alma mater to teach, but John felt that EMC still didn’t value business as a career – and thus had little incentive to provide quality instruction in business and accounting – and he passed up the invitation. In 1983, John died of a heart attack, leaving behind Mildred and seven children, including two EMU alumni, Beverly ’73 and Alden ’79 (in medical school then), plus two sons enrolled in EMC, Loren ’85 and J. Eric ’88. Daughter Ardith ’90, was enrolled in Hesston when her father died. Mildred says the family benefited from her husband’s financial expertise and foresight – he ensured that they would not be homeless, destitute and uneducated without him. Two decades after John Hostetter’s era as an EMC undergraduate, Daniel H. Martin ’69 had better luck studying business at EMC. He majored in “general business” – taking every accounting course EMC offered, from basic to advanced, augmented by courses like “business law” and “office machines” – but EMC still didn’t offer a major in accounting, with instruction in auditing. Dan had to pursue his CPA on his own later, after graduating from EMC and after doing voluntary service with Mennonite Central Committee for two years. In his first 14 years as an accountant, Dan worked for a Staunton firm. In 1985, he returned to Harrisonburg and became a partner in what is now known as Martin, Beachy & Arehart, PLLC. * One of the other three partners is also an alumnus, R. Scott Beachy ’88, who majored in accounting just a few years after that became an option at EMC. Martin and Beachy work in what was once a gracious home, now renovated into attractive offices, fronted by clear signage on busy N. High St., just a mile and a half from EMU. It’s a street corner that I pass at least three times a week as I head toward Community Mennonite Church, Rocking R Hardware, Greenberry’s Coffee or downtown Harrisonburg. In contrast to the cumbersome adding machines with rolls of paper that John Hostetter used at the beginning of his career, the technological resources of Martin, Beachy & Arehart have made their operations largely paperless. Scott and his wife Jodi Gerber Beachy ’89, who teaches grade 5 at Eastern Mennonite School, have two children currently enrolled at EMU – Emma, a rising junior who is majoring in biology, and Ryan, a rising sophomore who is majoring in accounting, as his father did. *Martin, Beachy & Arehart, PLLC, provides strategically oriented business advice and a wide range of services, including accounting and auditing, income tax preparation and related planning issues, and long-term business planning.